Have we really never done a review on a Nightforce scope? That seemed, and still seems odd! Once noticed I realized we had better change that since Nightforce is such a large player in the tactical scope world now. Nightforce is relatively new in terms of the established high quality scope manufacturers, they were established in 1992 and according to their web page have had the goal of making the finest rifle scopes in the world. To see how they stack up, we tested a Nightforce NXS 5.5-22x56mm with NP-R2 reticle and zerostop. The Nightforce scopes are in the upper price range of scopes with this model coming in at over $1800 (2010 US dollars) retail price. When you get into this price point the competition is stiff and we do tend to pay more attention to the little things, so do not be alarmed if we are a bit more nit-picky in this review than with a lower priced scope, it does not mean that we do not like the scope. First, I will state that it is wonderful to be reviewing another scope from a USA based company following the very nice Premier Reticle scope. But, there is some clarification to be made as to where the scopes are made. The new Nightforce Compact as well as NXS F1 scopes are manufactured and assembled in the USA, though I believe the glass is sourced from Japan. The tubes and glass for the rest of the scopes, NXS and Benchrest, are manufactured in Japan and then assembled in the USA by hand in the Nightforce facility in Idaho. There are some excellent optical companies in Japan and Nightforce uses the best they can get. The tube on the NXS scopes are marked “Made in Japan” on the bottom but that takes nothing away from the quality of the scopes. It is nice to see that they are moving more of the manufacturing over here to the USA and perhaps they’ll continue the trend with some of their existing models as well as their new models. 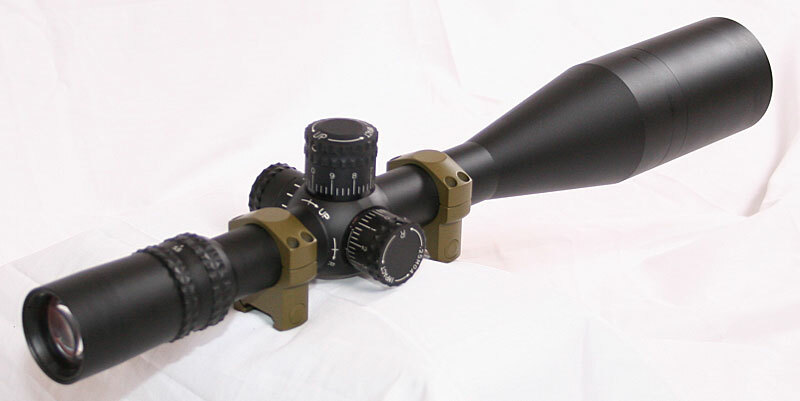 The scopes are well packaged in the unique Nightforce triangle boxes that offer plenty of space around the scope for protection. The scopes come with a “bikini” cover for the lenses, and we’ll talk more about flip up caps later in the review. There is also a nice manual and other good documentation including the warranty card. The scopes carry a lifetime warranty and having the company located in the USA makes getting service, if you should ever happen to need it, easy to achieve from the factory located in central Idaho. Each scope has an inspection sticker that is signed by the QA person who did the inspection and you will see the sticker in a few of our images in this review. Once I realized it would probably make better pictures without it on the scope, I removed the sticker. The overall shape and size of the scope puts it into the “large” category but not overly large like the Permier Reticle Haritege scope. When building a scope for the military and law enforcement sniping community that is not known for being gentle on their equipment, you do have to build a rugged and robust scope which involves some size to be added. The tube is a 30mm tube machined from 6061-T6 aluminum and Nightforce claims they are 2-3 times thicker than other riflescopes. The Nightforce tubes are not a one piece tube but the method and means by which the tubes are assembled are extremely durable rugged. The tube has a nice matte black anodized finish that is evenly applied over the entire scope and appears to be fairly thick and rugged as well. The overall shape and design is pleasing and about what you would expect from a well designed high end scope. The eye piece rotates in the traditional (non fast focus) way to adjust the dioptre, there is also a locking ring to lock the eyepiece once you have adjusted the reticle focus for your eye. The locking ring itself has serrations on it to aide in griping the ring when tightening or loosening it. These are all fairly standard things in regards to an eyepiece. The power selection ring has very similar serrations as the eyepiece lock ring and it has nice white markings to indicate the power setting. These markings are flat and cannot be read from behind the scope without raising your head a bit to be able to see the markings. When adjusting the zoom power, the entire eye piece rotates, which is fairly unique for a high end scope. The Burris XTR tactical scopes do the same thing and it makes using flip up scope caps very difficult as the caps themselves rotate around with the eye piece as you change powers, and with a scope that has a range of 5.5-22x, there can be a wide range of rotation. When I asked Nightforce about this they indicated that by doing it this way it allows them to make a more rugged eyepiece that will stand up better in harsh environments. The flipup caps are not a huge issue especially if the tradeoff is a more durable combat ready scope, but some who just love their flip up caps may find this bothersome. There are other very rugged and durable scopes from other manufacturers that do not rotate the entire eyepiece, so I suspect it was a design vs cost engineering decision combined with gain of additional durability that they are priding their selves with on their scopes. The knobs are a large exposed knob with good height to them and are mounted on a fairly high and rounded shoulder. The same style serration that is found on the power ring and eyepiece lock ring is carried over to the three knobs as well. The numbers are fairly large and are clearly marked with wide gaps between each click. The clicks themselves have a very nice feel that can be felt when wearing gloves and are just about exactly the way I personally like them. The clicks are audibly subdued as well so there is not much in the way of an audible signature. The large gap in the click allows for very few mistakes when adjusting your elevation, such as going more clicks than you intended. But with the nice spacing between each click on the knob, it does take up a lot of room and there is only 10 MOA of adjustment per revolution which can lead to several rotations on the knob when going to and from long ranges. There are some nice horizontal marks under the elevation knob to help track which revolution you are on, but it still can require some diligent tracking on the shooters part to help keep track of where you are at in the elevation range. With 100 MOA of elevation travel and 10 MOA per revolution, simple math tells you there are 10 revolutions possible. This scope also had the zero stop feature which does help to keep track of where you are in the elevation range. Or, more specifically, it allows you to quickly get back to your initial reference point quickly. Once you zero the scope at the range you desire, you then set the knobs to zero which will set the zerostop. Then at any point you can just adjust your elevation down until it stops, which will be your initial zero. Variations of this feature has been around for a while on various scopes but it has become popular recently and Nightforce does a nice job with it and has patented their design, though it is a fairly expensive option running about $170 added onto the price of the scope. The elevation knob itself is removed to adjust your zero by using the set screws at the top of the knob. This allows for exact placement of your zero mark to prevent the indicator mark pointing at a “half” click. Overall, the Knobs are some of the nicest out there, I really like the size and shape and especially the clicks, though 10 MOA per revolution can be a burden. I will state the while writing this review Nightforce announced that beginning in mid 2010, they will have a 20 MOA per revolution knob available with .25 MOA clicks. The pictures look very nice and if they can keep the same click feel, it will be a winner. The windage knob is the same shape and size as the elevation knob and has the same nice clicks and set screws at the top to allow precise setting. On this model the windage knob did count up in both directions and overlapped at 5 MOA, which with a 308 175gr can account for 10 MPH cross winds up to about 600 yards before you will need more and the overlap starts. This is not that big of a deal, you just need to be diligent about tracking where your windage is set and remembering it. The windage knob does have marks beneath the knob as well to help track, but on a windage knob those lines are usually not that useful as you do not travel the many rotations like you do with the elevation, though with 10 MOA per revolution those lines may come in handy. I will mention that in addition to the new 20 MOA knobs coming out, Nightforce does have an option to have 1 MOA per click elevation knobs combined with .5 MOA per click windage adjustments which for combat sniping situations might be the way to go. This would allow for 40 MOA per revolution on the elevation and 20 MOA for windage. This would allow for keeping the knobs in a single revolution scenario for most all your needs. Having used the Leupold Mk4 M3 on a M24 for several years while a sniper, I can attest that for most military type applications this works well. Nightforce does also have BDC marked knobs for the M118LR and A191 rounds for these 1 MOA elevation knobs. This option may potentially be something to look at. Of course, Nightforce also offers milradian knobs with 5.0 of MILS per revolution which equates to a tad over 17 MOA per revolution. Along with the new 20 MOA knobs coming out in 2010, they will have a 10.0 MIL knob as well which is over 34 MOA at .1 mil per click. Nightforce seems to have a handle on what is needed and they will offer both the 10 and 20 MOA knobs side by side. I have not heard if there will be a price difference. The focus knob on the left of the scope is a bit longer/taller than the elevation and windage knob but has the same basic shape with the same serrations on the top. The scope has a nice wide focus range and the knob does have some decent indicator marks without numbers, which is fine, and an infinity mark at the top end. The focus on the scope worked just as you would expect and nice sharp images were easy to achieve. 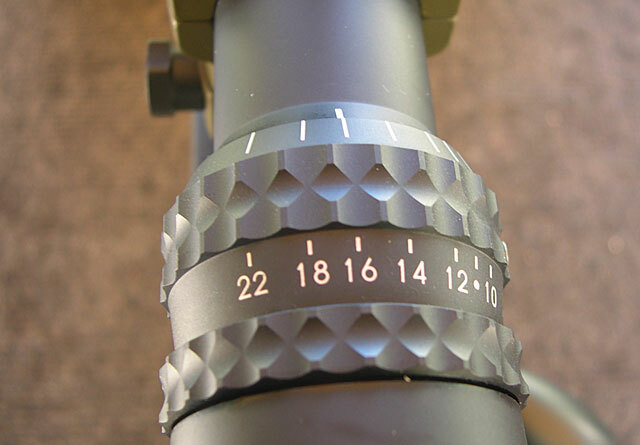 The focus knob also contains the on/off switch for the illuminated reticle, which all NXS scopes have. You simply pull the knob out to turn on the illuminated reticle, push it in to turn it off. So how do you make the reticle more or less bright? Well, that is not so easy. You have to remove the top of the focus knob where the battery is located and then remove the battery. At that point you turn a little brightness control screw with a small flat blade screw driver. It is not something easily done while in the field as the brightness setting is a sensitive part. I suspect that the engineers at Nightforce had to weigh their options of another set of controls to control brightness versus its real benefit. I suspect that they came to the conclusion that setting the brightness to an intermediate level will probably cover 95% of the situations, which it probably does. Is it worth the other 5% of the time to add additional complication with another knob and then trying to find a way to integrate it into their existing design that focuses on ease of use in combat. I do not know if it is better, but it does keep the controls simple and easy to use, and I suspect it helps with durability and it probably will be just fine for all normal shooting conditions. It is something different than normal, and perhaps that is not bad. The reticle on this particular scope was the NP-R2 reticle which is a hash style reticle but calibrated in MOA and not Milradians. This puts the reticle and the knobs in the same units and still allows range finding just using the MOA formulas instead of the Mil relation formula. The reticle is a clean design without too much clutter which I like. 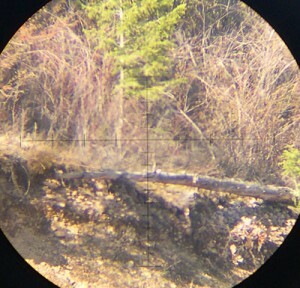 The picture of the reticle taken through the scope above (next to the specs) is admittedly not one of my better pictures so the reticle is a bit difficult to see, at no fault of the scope. Here is a spec sheet image of the reticle from Nightforce. Each of the hashes on the vertical stadia are 2 MOA apart where the hashes on the horizontal statia are spaced 5 MOA apart. When illuminated, the entire reticle is illuminated in red. Nightforce offers a wide array of different reticles that should meet just about any ones needs. The reticles are etched onto the glass for durability with no chance of breaking. This was a specific request of the USA Army back in the day when they were developing the M24 with the M3A scope and Nightforce does it standard on all their NXS scopes. The optics on the Nightforce scopes are excellent putting them right in there with all the very high end scope makers. Without advanced measuring equipment, it is impossible to say if the optics are better, or worse, then other high end scopes like S&B, Zeiss Diavari, Hensoldt, Premier Reticle, etc. But they are right there with them with excellent brightness and clarity. Certainly a pleasure to look through and will work great in all conditions. The scope was mounted onto a Tactical Operations XRay-51 for our shooting trials and at the range the scope performed brilliantly with no problems and everything functioning very well. We shot the scope through the box to test the accuracy and repeatability of the elevation and windage adjustments and the settings were right on after shooting the groups at each corner of the box using the same aiming point and adjusting the knobs to move around the box. The last group fired finished right back on top of the first group where we started. 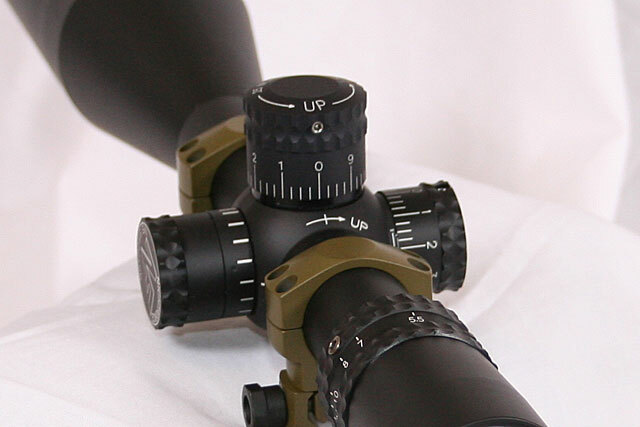 The direction indicators are marked on the shoulder of the scope and they are a bit hidden behind the rings, but not too bad with just a slight lifting or tilting of the head making them visible. The rings used for this evaluation where Leupold Mk4 rings. The scope has a very generous eye relief, almost 4″ (3.9″/99mm), which makes it a good fit for high power rifles. 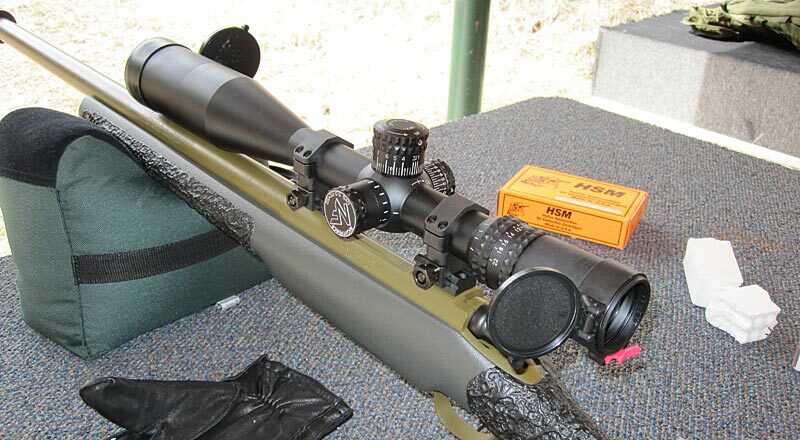 With the excellent durability the NXS scopes make a nice match to the .50 BMG. Operationally the scope works very well and everything falls into place as it should and the optical performance is outstanding. The scopes compare very favorably to other high end scopes and with the focus on durability Nightforce has developed a rugged yet precise and great performing scope. From thicker tubes to hand bedded glass bonded in place, these scopes are made to withstand the rigors of military and LE use and have a great track record to back it up. There are a few little design quirks if you want to use flip lens caps or want adjustable illumination brightness, but all and all the scopes are very nice and should be considered if you are in the market for a tactical scope. After completing our review above I wanted to explore further what the Nightforce could do if setup as a military style weapons system with a 300 Win Mag and long range knobs as I mentioned in the review. I contacted Nightforce and requested a T&E scope, the same NXS 5.5-22x but this time with a 50mm objective and in order to not have to rotate the Knobs around as much, it was ordered with 1 MOA elevation and .5 MOA windage clicks. Finally, I requested the Bullet Drop Compensation (BDC) elevation knob for the A-191 cartridge which is the 190gr Sierra Match King launched at 2950 fps. The scope arrived in good order and I set it up, using Nightforce rings on our Alpha-66 in 300 Win Mag. If you take a look at the elevation knob in the picture above you will notice the whole numbers spaced along the top of the knob. These are the range markings in hundreds of meters. So if you see that 11, that is 1100 meters. For the A191 knob the markings go up to 12 (1200 meters) all on the single revolution of the dial which is due to the 1 MOA clicks. There are actually enough adjustments to go up to 1300 meters but there are some data markings that prevented there being room for the 13 mark. I will probably mark it with a single painted dot just to have the 1300 meter reference on the knob. I really like how they marked the range numbers with a heavier line that extends all the way to the bottom of the knob; this makes it very easy to know when you are exactly on the specified range mark. That is a nice touch. The knobs still have that excellent tactile click and are very precise and easy to adjust. The windage knobs on the scope count up in both directions and with .5 MOA clicks there is a lot of available travel to compensate for wind at long ranges. Having 1 MOA clicks on elevation and .5 MOA for windage does introduce the potential for getting the number of MOA’s confused, but I can attest to the fact that it is not that big of a concern after doing it for a number of years in the US Army with the M3A scope on the M24. The clear number markings always help as well. These 1 MOA knobs combined with the BDC had the exact effect that I wanted and has made the scope and rifle system very usable in the field. Having all the marks in a single rotation helps simplify things dramatically and the adjustments between ranges is very quick with the large clicks. Yes, you do give up precision so this is probably not recommended for a competitive shooter, but for combat conditions the larger 1 MOA clicks do get the job done, though at longer ranges, you may find yourself holding “a tad” high or low to compensate when a full MOA click is too large for the adjustments you want. All and all I am very pleased with this arrangement. Keep in mind that every BDC is only accurate in one given environmental condition and will always be slightly off one way or the other depending on conditions. This BDC got me “on paper”, actually steel in this case, through all the ranges we tested which is all you can ask for. Detailed logging in all environmental conditions is now important to be able to compensate for differences while in the field. I also wanted to try out some Butler Creek flip-up caps on the scope to see if there was a way to have the BC caps on the rotating eye piece and still have it work okay in the field. Of course, the cap on the objective end of the scope is no problem and works just like on any other scope. But as mentioned in the above review, the entire eye piece rotates when changing the magnification. From 5.5-22x, the eye piece rotates about 180 degrees. I tried several different locations of the flip up caps and there is no one perfect place, but you can play with it and get it to work in a majority of the magnification ranges you will be using. I believe it would just be a matter of determining what you would view as the most useful magnification range and then adjusting your cap placement based off of that. There are a few ways to set it so that it would work through the entire range of magnification, but it would be a bit annoying or cumbersome in some positions. In the end, you can make it work for you and still have it provide the lens protection in the field. Of course, there are other alternatives as well. With the above changes to the scope I have grown to like it even more, but I do admit I use my rifles more in the field than at the range where the large 1 MOA clicks become an advantage. 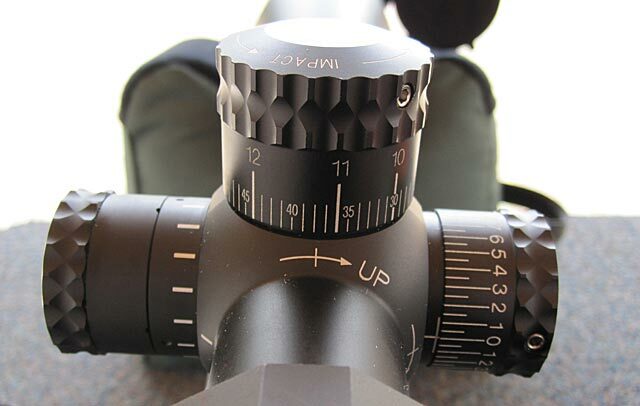 If you are looking for tight groups in the X-Ring, then the standard knobs are probably a better choice to allow you to more accurately adjust your scope. You can also wait until the new higher resolution click knobs come out later in 2010. Good info. Just bought myself one for my Remington XCR 300 Tactical. I own this exact scope mounted on a Tactical Rifles M40 w/ heavy 26″ match barrel. The end result is worth drooling over. I absolutely LOVE it! Great info. I’m about to make my first “scope” purchase for my SSG-004 300WINMAG. This is definitely at the top of my list. I’d also love to hear more from your endeavors as a sniper. I’m a definite fan and a long range precession shooter wannabe. Keep reading, we are constantly updating the page with all kinds of content! This really was and excellent review I have and nxs same as mentioned x56 and love it! I have it mounted on my HS PRECISION 300 mag witch is a beast! The combo of the 2 are amazing. Thanks for a really great article. Very Googd Article on a Scope I am interested in. Thank you for your inputs !